As a HUGE movie person (I was actually a film studies major when I first went into college) and a HUGE genealogy person, I was thinking "how can I combine my two passions?" Well, I don't know if I've stumbled upon the answer yet or not, but it has got me to thinking about what role movies have played in my family tree and traditions. Here are some movies that are either important parts of my family tree and/or traditions. Fiddler on the Roof. This movie is a holiday institution in my family. It started out as a Thanksgiving staple but lately its been getting airtime in my household on Christmas and New Year (and since I just learned it is coming on TCM tonight, Valentine's Day). Frankly, I'm willing to make up holidays just to see this film and I am looking forward to passing on this tradition to future generations. The Sound of Music. My grandmother never really knew how to relate to little kids and honestly, they pretty much just drove her crazy. That's why she never had any kiddie things around, including movies so when I was little and we would go see her (usually about once a month) she would put this on for me as it was really the only movie she had (besides Fantasia which I thought was mind-numbingly boring) that she thought would keep me entertained for a few hours- and she was right! While the whole "hills are alive" thing kind of freaked me out, I loved everything about this movie. It also holds a special place for me because of the song Edelweiss which is one of my mother's favorites (when I was born she got a music box for me that played it). Later on, she would also show The Unsinkable Molly Brown and How the West Was Won when I came over which are lesser favorites of mine (though I think my love of Debbie Reynolds came from these movies). A Christmas Carol (George C. Scott version). I kind of have a love/hate relationship with this movie because I've seen it SO many times. Starting about the day after Thanksgiving my father starts playing this movie and then he plays it again and again and again and again and... well, you get the picture. This movie was basically on everyday until New Years in my household. While it is a good movie, my father's obsession with it still remains a mystery to me. We would also see the Reginald Owen version for time to time, but those are the only two versions he feels are faithful to the original story. The Wizard of Oz. This is a 4th of July tradition that started later in my childhood (maybe a little before Jr. High). I saw it lots of times when I was little, but it wasn't anything special (Funny aside: growing up, the tape we had of this movie cuts off the sepia opening and starts with Dorothy just landing in Oz. The first time someone told me the song Over the Rainbow was from this movie I didn't believe them). One 4th of July I caught it on TV with the dialogue removed and replaced by Pink Floyd's The Dark Side of the Moon and that was actually the first time I saw the movie and actually really liked it. I've never seen the movie that way again, but I still watch it every 4th of July and sometimes I put it on mute for awhile and play The Dark Side of the Moon in the background and I'm a ten year old in awe all over again. I've talked to my mother about what movies she saw growing up and it was clear from the way she talked that going to the movies was much more of an event in her family than it is now. They lived on a farm, about twenty minutes from the nearest theater so I can understand why they didn't go to the cinema very often. My mother remembers seeing the 7th Voyage of Sinbad when she was little and Georgy Girl when she was older. 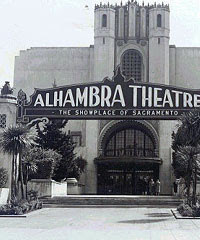 She also remembers going to The Alhambra as a girl and what a special event that was. I haven't really talked with my father about movies from his youth, although one day I was watching A Man Called Horse and my dad mentioned going to go see it with friends when he was in college. I know that Lawrence of Arabia is a special movie to him. He read a biography of T. E. Lawrence when he was a boy and later The Seven Pillars so I know Lawrence's story is one he is fond of. He also has the original Lawrence of Arabia soundtrack album (from 1962!) so I'm guessing he did go and see it when it was in theaters. I also remember watching Zulu a lot when I was little and I believe he went and saw that in theaters (it is another one of his favorites... I'm just now realizing that all of his favorite movies are British military films). I plan on asking other relatives what movies they liked/remember seeing growing up and posting a second part to this post (I'm going to also try and remember what all my favorite movies where when I was little and include then too). Another thing of note, I remember reading an old family letter from 1913 in which a relative of mine mentions seeing one of the new "moving pictures" on board a ship he was on in the south Pacific. I'll dig it out and post it!